a. 4 4" r., 4 6-pdrs., 4 11-pdrs., 1 3" r.
HELENA's first assignment was with the North Atlantic Fleet, cruising primarily in home waters. During the Spanish-American War, she stood by in Cuban waters, where she saw action several times. On 02 and 03 JUL 1898 she exchanged fire with enemy batteries at Fort Tunas. On 18 July she was part of the squadron which closed the port of Manzanillo by sinking or destroying eight small vessels there during a vigorous attack. The great problem facing the United States at the close of the Spanish- American War was the Philippine Insurrection. To aid in suppressing this rebellion, HELENA sailed from Boston 03 NOV 1898, bound for duty on the Asiatic Station, via the Suez Canal, arriving Philippines 10 FEB 1899. On 21 MAY 1899 she was present at the evacuation of Jolo by the Spanish and the landing of American troops to replace them. During June she stood by with other vessels in Manila Bay to support the Army during its offensive south of Manila into Cavite Province. One of her landing parties brought troops ashore in an assault which carried strong defenses along the Zapote River 13 JUN. On 07 NOV 1899, HELENA bombarded San Fabian in Lingayen Gulf, and covered the landing of 2,500 troops there. Just 45 years later, American troops would once more storm those beaches while American naval guns boomed in support. 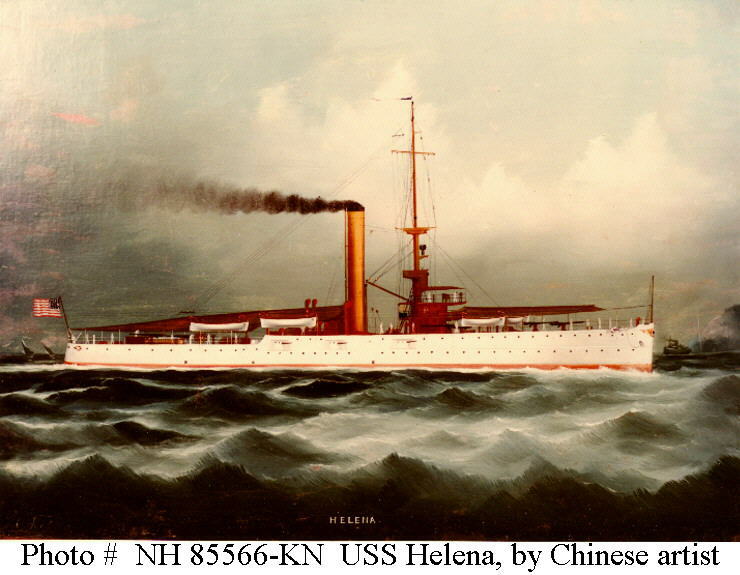 HELENA remained in the Far East for the rest of her naval service, engaged in protecting American lives and interests. She served in Chinese waters from October 1900 until December 1902, then returned to the Philippine until March 1903 when she sailed back to the China coast. In December 1904, she moored once more at Cavite in the Philippines, where she was placed out of commission 19 APR 1905. HELENA recommissioned 16 JUL 1906, and cruised on the Asiatic Station until June 1907. From that time on, with intervals for overhaul, HELENA served both with the South China patrol and Yangtze River Patrol. She was placed in reduced commission 29 JUN 1929, but continued to serve on the South China Patrol until 27 MAY 1932 when she was decommissioned and struck from the Navy list. She was sold 07 JUL 1934.